Listening is an experience, it is a way of experimenting with the place. For a practitioner of listening with a creative purpose, it seems impossible and even out of the question to try to escape from the subjective aspect that is induced by such an experience. Everything that paves the way between perception (aural or visual) and its re-contextualization is filled with intentions, choices and the use of tools that shatters any possibility for translating a reality of any kind. These choices are inherent to every form of creation, but it is getting more complex when it is about the sound environment, which is usually perceived as one entity. Therefore, many works are conceived as the expression of an ecological intention, as the description of a place rather than a form of musical writing or sensible artistic expression. However, we are well aware that we are all listening in different ways, that our auditory systems are not identical and that their restricted frequency range is not able to get everything of what the environment generates. Why, then, would anyone pretend to play something real? In my own work, I put the emphasis on subjectivity, which is omnipresent from the work in the field to playing back the sounds. The work is dealing with the environment, through whatever form of discourse, but in that sense I cannot claim for translating the reality of a place, because the translation would necessarily be wrong. This is why, most of the time, the place is not the only important aspect that motivates my projects. Yet I am trying to establish a coherence between what I am perceiving from the site – its visual and aural formal aspect – and the resulting creation. I am talking about what is directly audible in the site as well as its own structure, its architecture, its materials of construction – which are constituent elements of what is audible. This is why my work is about constructing a possible music that is ‘borrowed’ from reality, trying to avoid two pitfalls: the illusion of being able to transcribe reality, and the risk of being ‘consumed’ by studio technology and its many possibilities of transformation. It is a thin line, and the field of action seems reduced… yet I don’t feel captive of anything, neither in my apprehension of the environment nor in my ways of ‘talking about it’. What primes is the experience of listening and the experimentation of the soundscape as a self-reliant instrument, autonomous from the physical landscape. For me, such a practice as to be the result of sensibility, that of the individual standing in the place, and as to be taken out of any aesthetic system. 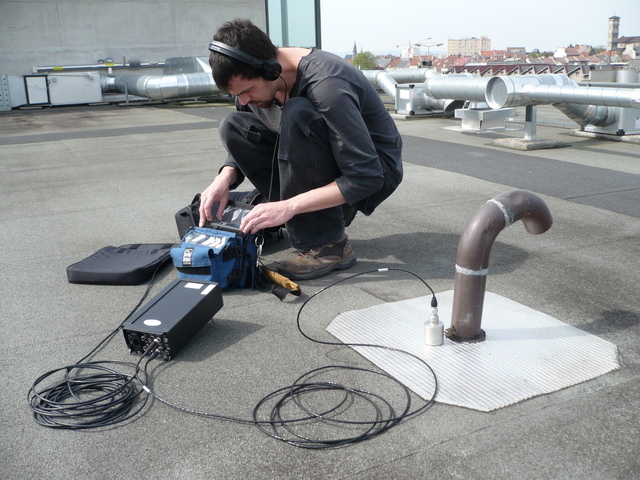 Field recording is not a musical or artistic ‘genre’, but the medium through which it becomes possible to approach one of the world’s complexity: sound. What I am saying does not try to make a truth of my personal protocols for working, the most important thing is to pursue a research and to commit links between the outside (of the studio) and the idea of music. Everything in my work is connected to that idea, and the resulting works re-enunciate the problematics of listening in a place. For instance, the idea according to which a soundscape is a combination of independent and/or interconnected elements and events, and that each one of these elements are coherent with their global context is very interesting to me. The possibility of their re-combination, then, produces a landscape that is reorganized under a new form, with new dynamics and a new temporality. The relation between sounds is transformed – actually, it already is at the moment of the recording – and the physical relation to sound is enhanced. The representation, whatever its form is, is an opportunity for sharing a moment of listening, reflecting again from the position of the listener.